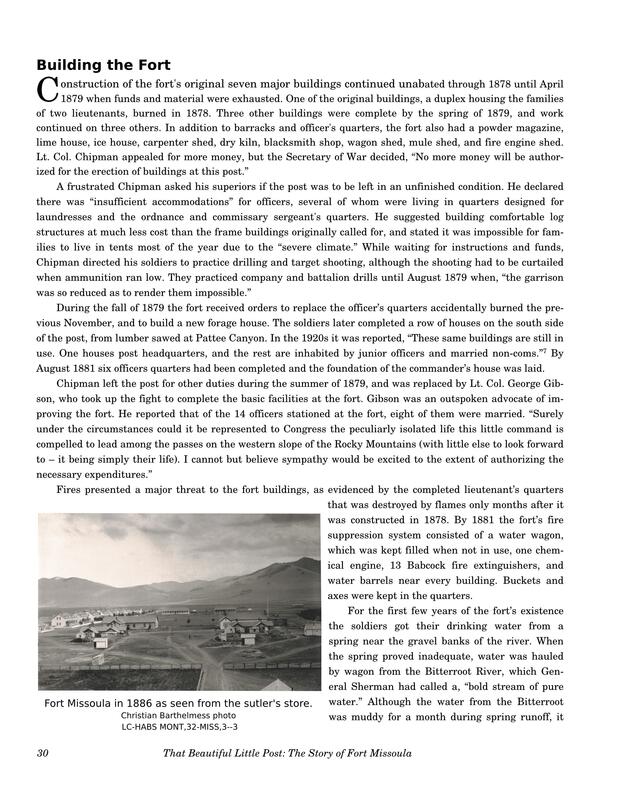 I have included a few sample pages below of: That Beautiful Little Post: the Story of Fort Missoula so that people can get an idea of layout and content. The book has 144 pages, illustrated by color and black & white images throughout. The book reveals the complete history of Fort Missoula, from the first conception until the present time. Stories told in the book include the establishment of the fort in the 1870s, the Nez Perce War of 1877, including the Battle of Big Hole, construction of the fort, reconstruction of the Mullan Road, relationships with local tribes, the Fort Missoula Bicycle Corps that made a 1,900 mile ride to St. Louis, reconstruction of the “Million Dollar Fort,” the Fort Missoula Detention Center during World War II, and the transition of a military post into a treasured community asset. That Beautiful Little Post contains a detailed account of the original construction of Fort Missoula, from the original buildings started by the 7th Infantry, to the expansion of the post ordered by Gen. William T. Sherman, to construction of of the “million-dollar” post from 1903 to 1911. It also includes the expansion for the Civilian Conservation Corps in the 1930s, and the construction of the Alien Detention Center in the 1940s. 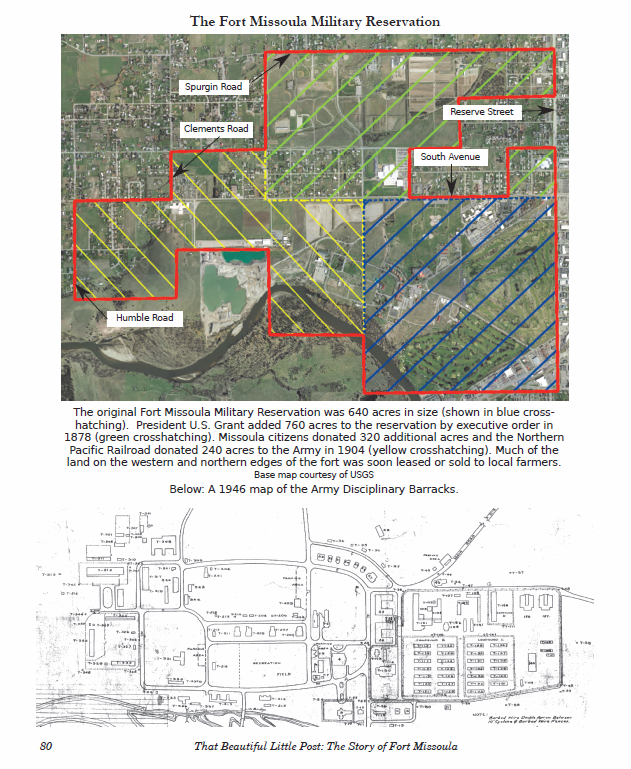 Due to confusion about the location of the property lines, much of Fort Missoula was built, not on the designated military reservation, but on adjacent state land. This threatened funding for Fort Missoula for many years. 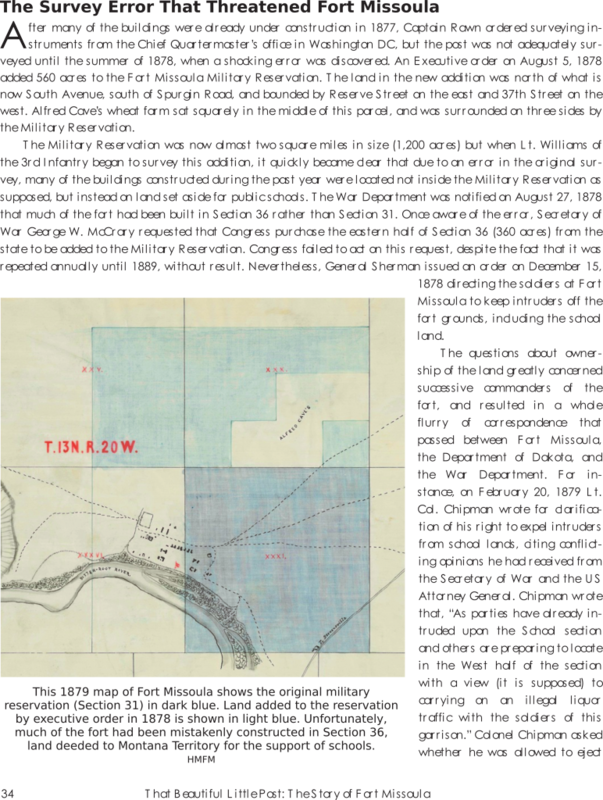 The book contains numerous maps detailing land ownership, construction of the fort throughout several eras, and maps of the Fort Missoula Timber Reserve and the Fort Missoula Regional Park. The NCO quarters on the grounds of the Historical Museum at Fort Missoula was built in 1878 and is the oldest building on the fort grounds. 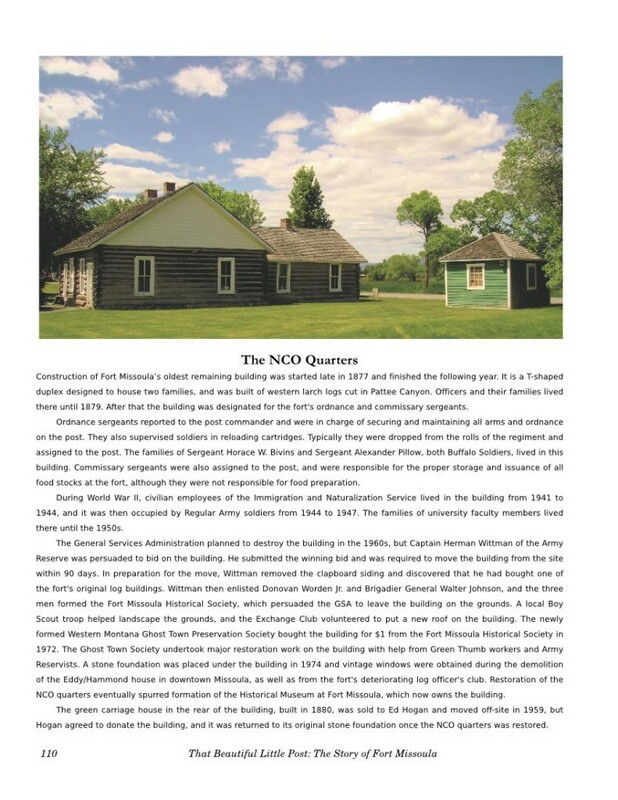 It was usually occupied by the families of the Ordnance and Commissary Sergeants.